2012 saw the start of another 3 year jersey cycle and yet another jersey redesign by the Warriors. For the first time since 2003 the jersey had chevrons (V's). The jersy would also incorporate red into the jersey as a nod to the main sponsor Vodafone. Despite having already played 3 home games, including the Round 1 match against Manly at Eden Park, the team wouldnt wear the home jersey until Round 7 against the Rabbitohs. 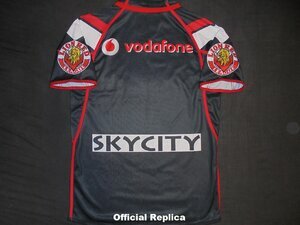 OFFICIAL REPLICA - As happened in 2003 the Warriors new strip sold extremely well after their Grand Final appearance the previous season. This jersey is always being sold online and can go for as little as $40 with the bigger sizes doing better in price. PLAYERS JERSEY - Same as the official replica but tapered and a white number on the back. Number had small pin holes on it all over. Assuming that was to improve the breathability of the jersey.